The Ebdanians hold the seat of power at a tumultuous but opportune moment. Occupying the island called 'Hibernia' by the Greeks and Romans, they were first recorded in the Greco-Egyptian writer Ptolemy's 2nd century AD treatise on 'Geography'. Making their home on the eastern shores, the tribe settled between two river estuaries - the Buvinda and Oboca, approximately where the city of Dublin now lies. Relationships between clans is what drove barbarian culture and society, as clans inter-married, traded and warred with one another. Tribal life in Gaelic Ireland revolved around the clan, an extended family built on kinship, loyalty and, generally, a common ancestry. 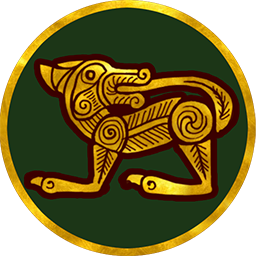 Hibernian clans were supposed to have been descended from one man, the authority to rule passing down the male bloodline. This means that most clansmen were of the same blood, although fostering and adoption were as common as in other parts of the world. Clans were led by their chieftain, who sat at the top of a strict hierarchical social structure. These lands will be liberated, one turf at a time. All units have guerrilla deployment. -15% movement speed reduction in raiding stance . 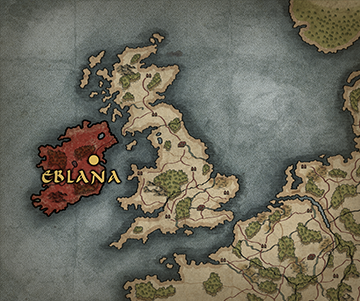 A warlike Celtic tribe from eastern Hibernia, the Ebdanians wish to see Britannia free from oppressive Roman rule, and safely under their own! Income: +100 for every 10% damage caused to settlements during a battle.